Suppose you are on holiday in Japan and want to purchase a pair of limited edition sneakers with your credit card. The merchant presents you with a bill of ¥‎30,000 and asks politely “Would you like to pay in your billing currency (SGD) or in foreign currency (JPY)?” Which currency should you pick? Should you pay ¥‎30,000 or S$398? Paying in foreign currency (JPY) is the far cheaper option. Depending on the country, paying in your billing currency (SGD) may potentially result in additional costs as high as 15%. Apart from this, you may also lose out on credit card rewards (if any) on foreign currency spending. If the merchant does not offer you this choice, remember to ask for it. The terms and conditions by both Visa and MasterCard stipulate that merchants must inform the cardholder either verbally or via a terminal that they have the right to choose the currency in which the transaction will be completed. Before we can understand why paying in your billing currency (SGD) would cost so much more, let’s first understand what the conventional practice is. Completing your transaction in the foreign currency (e.g. JPY) is the standard practice. When you pay in foreign currency, your bank will take the foreign currency amount and convert it to SGD (usually to USD first then to SGD) based on the exchange rate provided by your card association. The card association generally calculates blended rates from a range of sources from wholesale currency markets, then make these rates available to the issuing banks. The issuing banks may then adjust the exchange rates in your credit card bill. Based on this converted SGD amount, your issuing bank then adds the currency conversion fee (usually 1.0%) imposed by the card association and imposes its administrative fee (usually 0-2.5%). As a reminder, here's a typical breakdown of the fees incurred when you pay in foreign currency, using DBS as an example. We delve into the details of overseas credit card fees (with examples) here. The higher cost of paying in your billing currency (SGD) is a result of something called “Dynamic Currency Conversion” (DCC). DCC is a financial service offered by payment solution providers (e.g. First Data, Global Blue) that allows the cardholder to pay in their billing currency (SGD) when using their credit card overseas. The following table shows a typical breakdown of the fees incurred when you pay in your billing currency (SGD), using DBS as an example again. While the fees for paying in SGD (1%) look lower than the fees for paying in foreign currency (2.8%), nothing could be further from the truth. The higher cost of DCC mainly comes from the foreign exchange rate difference. Remember that when you pay in foreign currency (JPY), your issuing bank takes the exchange rates from the card associations and applies it to your overseas credit card transaction. On the other hand, when you pay in your billing currency (SGD), it is the merchant or DCC provider (payment solution provider) who determines the exchange rates, not the card association. Now this is where the extra costs come in; the exchange rates determined by them are almost guaranteed to be extremely unfavourable to you. Exchange rates from merchants/DCC providers have been observed to be 3-15% worse than the exchange rates from card associations. DCC providers take this opportunity to charge a higher foreign exchange margin, and this additional revenue generated is shared between the DCC provider and the merchant. 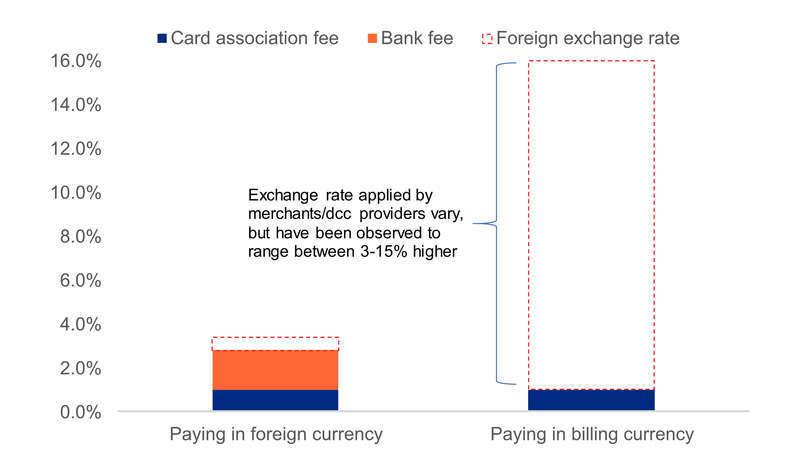 In fact, DBS also highlights that the exchange rate used for DCC transactions are generally less favourable than paying in your billing currency. The key takeaway here is that the foreign currency conversion rate given by card association is favourable enough to offset the administrative fee imposed by the bank (0-2.5%, depending on the card). Why does DCC exist and why is it so expensive? DCC providers market the service as a “convenient” way for travellers to pay in their home/billing currency, a currency that they are most familiar with. Travellers would know on the spot exactly how much they’re paying in their home currency, instead of having to wait for their credit card bill. However, is this worth paying 3-15% more? For a S$1,000 transaction, this could easily mean paying S$30-150 more. You can easily check the exchange rates on your mobile phone with Google to get a rough estimate of the bill in your home currency. If you want a more precise estimate, you can check the latest indicative rates by Visa and MasterCard. Whichever the case, using the DCC service is almost guaranteed to be more expensive than paying in the foreign currency. In fact, DCC providers often market DCC services as additional revenue for merchants, and/or as a way to reduce the cost of accepting Visa/MasterCard issued outside of their home country. Where would these additional revenues or cost subsidies come from? The consumers unfortunately! Do people really choose to pay in their billing currency (SGD)? Apparently so. There are no published statistics on this payment behaviour, but we can get a rough idea from DBS Visa Debit cardholders. According to DBS, foreign currency payments (eCommerce and point-of-sales) make up more than 20% of total payments for DBS Visa Debit cardholders in 2016, and around 10% of total payments were overseas transactions made in SGD. Depending on how DBS defined foreign currency payments, it could imply that probably one-third to half of the overseas transactions were made in SGD. While one could argue that the behaviour of debit card users differ from that of credit card users, it still shows that many Singaporeans do pay DCC charges. Always avoid paying in your billing currency (SGD) and insist on paying in the foreign currency. While in theory the merchant must offer you the choice of currency to complete the transaction, in reality many merchants proceed to charge you in your billing currency without offering the choice. Remind the merchant that you have every right to choose your currency, as stipulated by Visa/MasterCard’s terms and conditions. It is also worth mentioning that American Express does not support DCC, so you’ll always pay in the foreign currency. If the merchant completes the transaction in your billing currency (SGD) without your consent, you can file a dispute with your bank/card association immediately. For example, MasterCard’s rules state that “If a Cardholder complains that he/she was not given a choice in a DCC transaction, the Issuer has a chargeback right against the Acquirer.”.